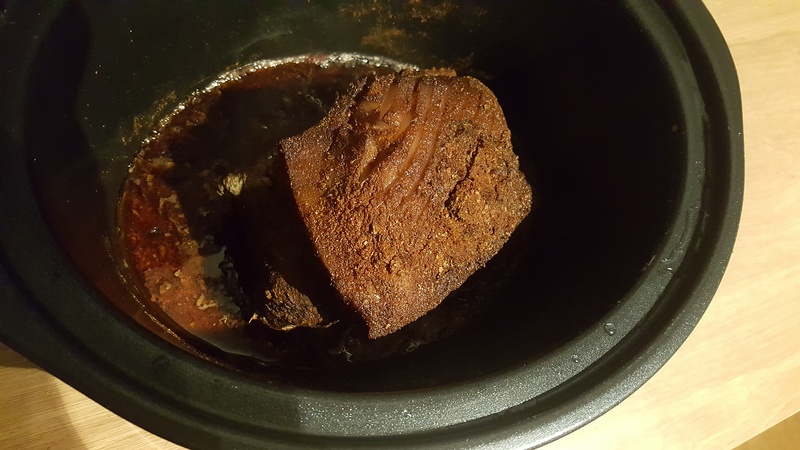 A love my slow cooker, it’s so easy and the results are pretty much always amazing. 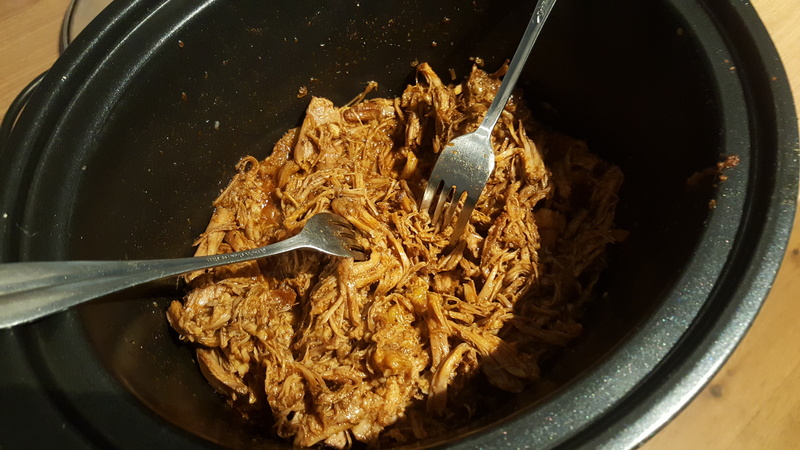 One of the first things I made was pulled pork carnitas using a recipe I found online, and I have adapted it over the past couple of years for simplification and ease. 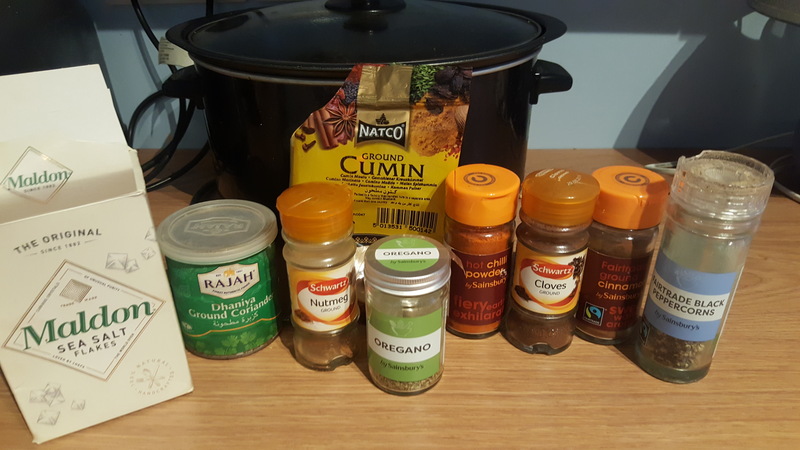 I was preparing some this morning so thought I would take a couple of pics for you all and write down the ingredients, as I seem to have the staple spices down now, but of course feel free to adjust to your taste! It literally takes me less than 10 mins in the morning, and then when I’m home at night another 10 to pull it apart and then however long it takes for you to make the accompaniments. If you don’t have some of these spices – like ground cloves, nutmeg or cinnamon, no problem they just add a warming element to it. One of the ingredients could suffice just don’t put too much as they can be overpowering. 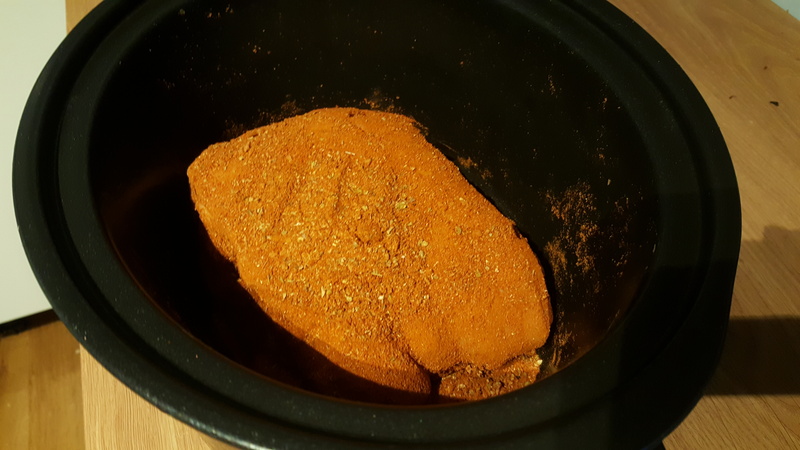 Also, this does make a medium spiced pulled pork, so if you are sensitive to chilli, then maybe take a tablespoon or two of chilli powder away as I don’t want to ruin it for you! Juice one of the oranges and then pour all over the pork and stir. Leave to rest while you do everything else. 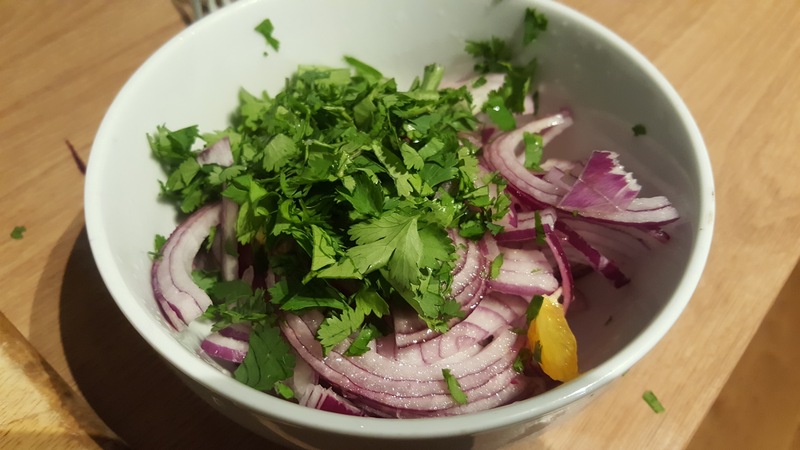 Thinly slice your red onion so they are even, around 1/2 centimetre is best in terms of thickness to give them bite. Juice one of the limes and the other orange and pour over the onions and chilli. You can add a handful of finely chopped coriander here if you like. Cover and chill in the fridge while you work on your sweet potato fries. If you are using coconut oil, melt a decent tablespoon in the microwave or a pan until liquefied and heat an oven tray in the over on around gas mark 8, 200 degrees Celcius. 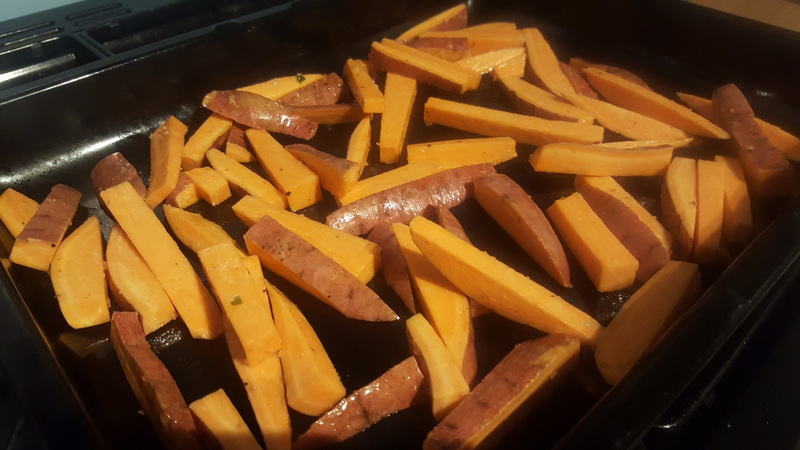 Slice your sweet potatoes into 1cm wide long skinny fries and it’s important these are as even as possible. In a bowl, toss the fries in coconut oil and plenty of salt and pepper, then spread evenly over the heated tray. Cook for around 40 mins turning to cook evenly. Thinly slice your quarter of a red cabbage. You can probably make around half the cabbage with the same amount of dressing, as this lasts all week and is very versatile. 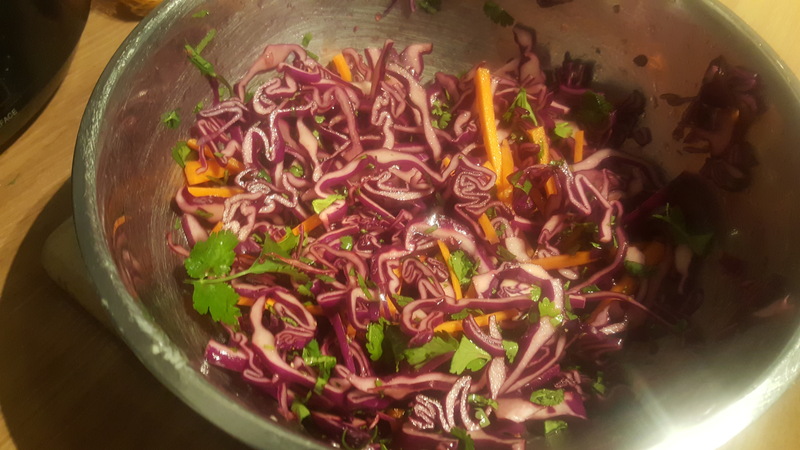 Chuck the cabbage into a bowl with your julienned (matchstick cut) carrot and coat it with the juice of the other lime, the cider vinegar and plenty of salt and pepper, and some chopped coriander if you would prefer. Cover and place in the fridge until the sweet potato fries are ready. I have a big plate of everything, and top the pork with the pink pickled onions for acidity and bite. If you are not following a grain free diet, then they make a really good taco! You can also make guacamole for a creamy texture, or of not dairy free then sour cream. 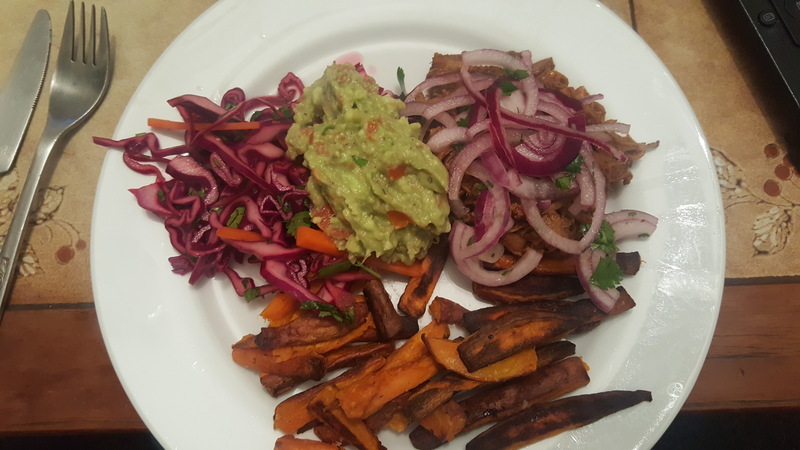 In total, once you are home from work this entire dish should not take more than an hour, and if you wanted to be really prepared you could even make the red cabbage and pink pickled onions in advance!